EZ Dock floating dock systems offer the perfect solution for nearly every situation. Please choose your particular situation below to learn more about how we can help you! We are happy to answer any questions you may have about our floating dock solutions! Because of EZDock's unique construction, versatility, and strength ... EZ Dock is the perfect solution for nearly every application. There is no end to the dock section configurations you can use to best fit your needs. Combined with tons of great accessories, we are sure you will find EZ Dock the best dock solution for you. EZ Dock is the most durable floating dock system available today - designed to withstand both severe weather storms and ice conditions. 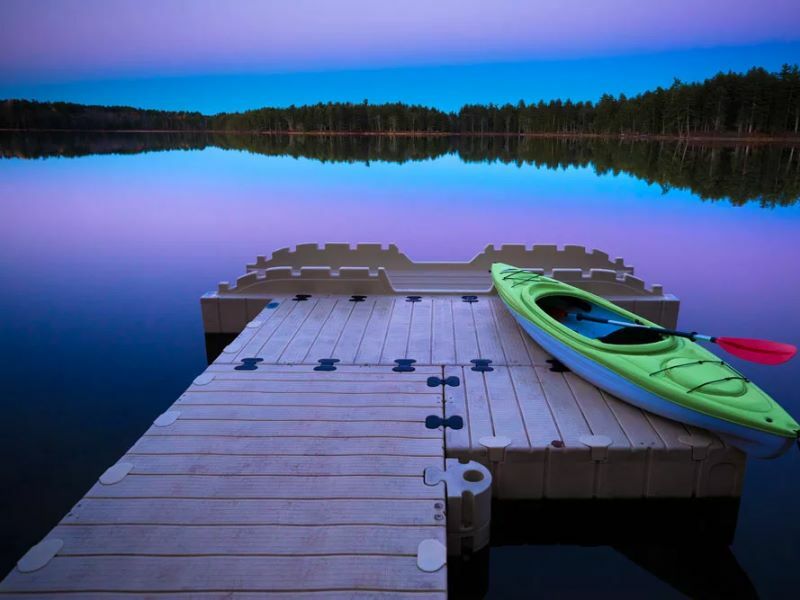 EZ Dock has no wood to splinter, no nails or screws or metal braces to cut, and a skid resistant surface - providing the safest dock available today. EZ Docks are incredibly stable. Our unique construction ensures the highest level of stabilty among all floating dock systems. EZ Docks are designed to be easily installed and are easily modified and/or expanded in the future, as your needs change. Our innovative flotation chambers and powerful connectors are the industry leader in strength, durability, and versatility. EZ Docks are modular. They can be configured to meet any need. Additionally, we offer THOUSANDS of customization options and accessories. Since the dock system is made completely of polyetheylene, there is no treated wood or metal to contaminate your environment. EZ Dock is the only dock permitted in sensitive environments like Adventure Aquarium - home to over 1,000 fish, rays and sea turtles. Whether you own a lakeside cottage or an oceanfront home, you want a low-maintenance dock that adds to the entire waterfront experience. EZ Dock lets you spend more time with your family, not your dock. Compared to other residential dock options, only EZ Dock gives you the complete package: a versatile, durable and nearly maintenance-free floating dock that you can tailor to your needs, and add to as your family grows. Say goodbye to painting, power-washing and winter dock removal. 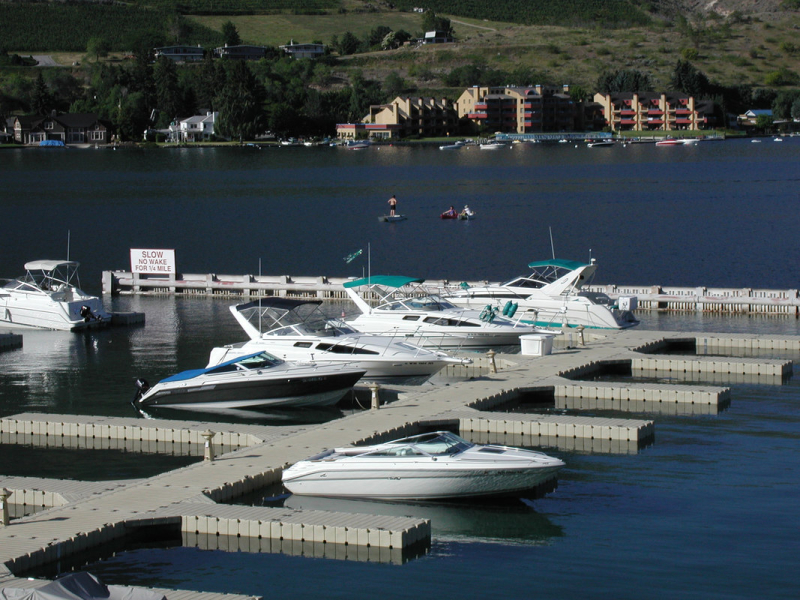 EZ Docks are durable, extreme cold weather friendly and virtually maintenance-free. Our floating polyethylene pieces assemble in a snap to form an exceptionally stable platform that adjusts easily to fluctuating water levels. EZ Dock changes easily with your needs. Start with a basic dock, then add optional slides, swim ladders, benches, and boat and PWC lifts to create your ideal waterfront environment. Your needs change, so why shouldn't your dock? Our factory-trained personnel are ready to help you make sense of dock permits, local codes, environmental standards and water conditions that may impact your custom design. Contact your local dealer for more information. Marinas. Camps. Fisheries. Hotels. Restaurants. Whether you want to develop a small dock for a swimming area, or build a complex marina with boat lifts, EZ Dock's innovative modular floating dock systems offer exceptional durability, adaptability and scalability. Docks for waterfront businesses are essentially about two things: convenience for customers and long-term property value for owners. With years of experience working with organizations ranging from small camps to large hotel systems, EZ Dock can customize a "just right" dock system perfect for your customers and your business. Contact your local dealer to get started. 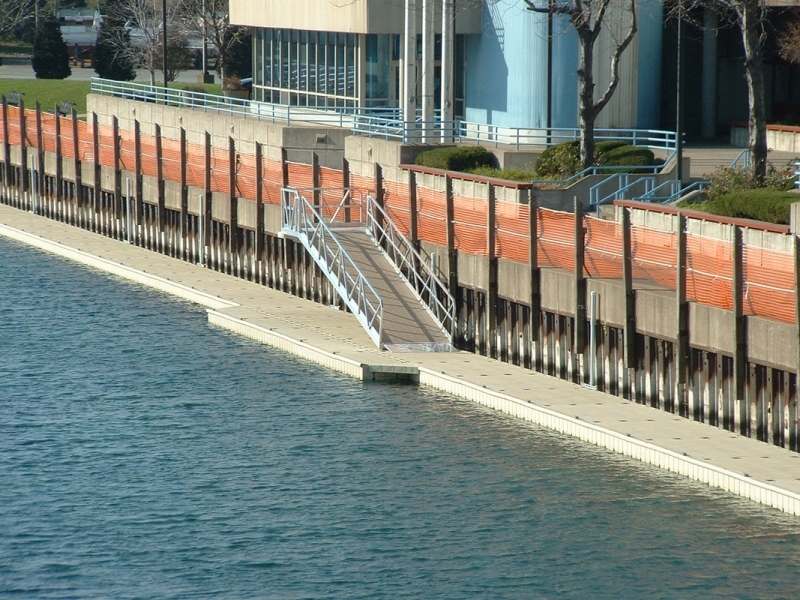 EZ Dock systems are superior when it comes to handling wear and tear from both customers and the elements. Our state-of-the-art engineering and manufacturing processes ensure high-quality products built to withstand the highest traffic and harshest water conditions. Civic jobs require reliable performance - no matter how challenging the mission or how difficult the water conditions. Plus, public safety is always at stake. That's why rescue teams, police security units and coastal fleets all over the country choose EZ Dock to get the job done. EZ Dock is ideal for virtually any on-the-water public activity: public amenities (wetland and woodland trails, beach access, swimming areas, boat launches); monitoring and education (marine monitoring, wetland research, environmental stations); emergency management (fleet docking, floating barges for supplies and temporary access after flooding) and infrastructure (waterways, dams, pumping stations). Working on water means there's even more at stake. 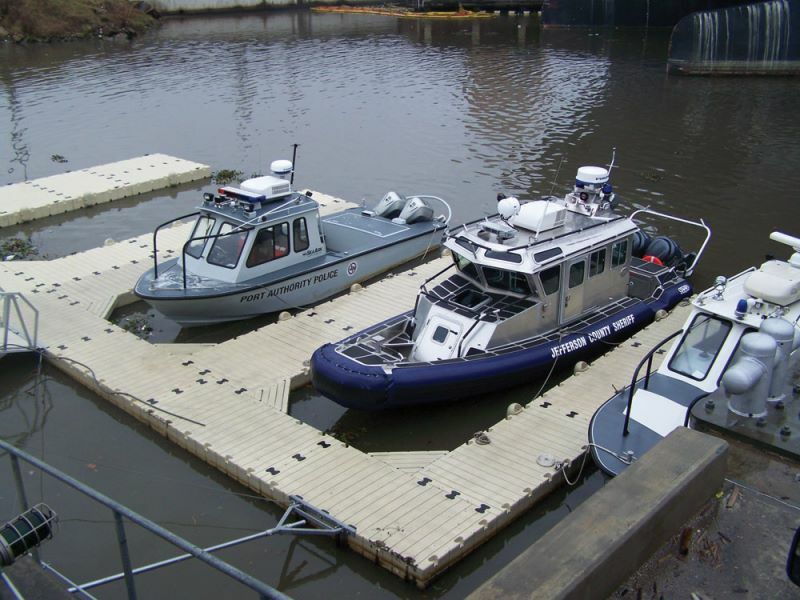 If you need a floating dock system for challenging industrial or military applications, EZ Dock gives you one of the most versatile, durable and stable floating solutions. EZ Dock's team of marine engineers can show you how to create an efficient and effective layout for almost any industrial or military situation. Call your authorized dealer and let us help with your mission. We can offer you a solution that suits your needs and budget. Unlike any other dock system, EZ Dock gives you a rugged, low-maintenance solution with exceptional stability, a slip-resistant surface, secure connection couplers, reliable anchoring systems, and the ability to adjust automatically to changing water conditions. We can provide suggested dock configurations with the exact cost of all the dock sections, the parts, and all the accessories necessary to make the most out of your specific situation.